SW-28 - Bigger is better with the SuperSink SmartWasher. This model is loaded with features and includes an extra large work surface for all jobs, large and small. A second workstation can easily be added allowing two people to work at the same time. Our industrial parts washer will get the job done fast, safe and effective. 47" x 38" x 42. 41" x 26" x 8. An Industrial Parts Washer Your Company Needs. If youre looking for a large industrial parts washer that can fit your companys growing needs, then the SuperSink SmartWasher is the answer. Safe and easy to operate, our SW-28 requires very little maintenance to maintainsimply change your OzzyMat every 30 days. Our industrial parts washers combine powerful, aqueous-based degreasing solutions called OzzyJuice and a specialized particulate trap impregnated with safe, naturally occurring microbes called an OzzyMat. The OzzyJuice cleans the oil, grease and grime from the parts while the microbes clean the oil, grease, and grime out of the OzzyJuice. This patented process uses bioremediation. Bioremediation is the act of treating waste or pollutants by the use of microorganisms to break down harmful substances into safe, non-toxic substances. SuperSink SmartWashers work exclusively with OzzyJuice, a powerful Aqueous based degreaser that is safe for the environment and your employees. 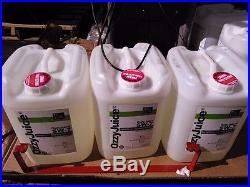 OzzyJuice is non-caustic and will not dry, crack or damage hands. 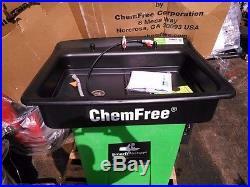 ChemFree to locate a distributor near you. Since our industrial parts washers utilize the latest in bioremediation technology, the SW-28 will eliminate hazardous liquid waste and transport charges. Try out our savings calculator. SMARTWASHER® the successful merging of science and technology. SCIENCE is a systematically organized body of knowledge about a particular subject. An activity that is the object of careful study or that is carried out according to a developed method. TECHNOLOGY is human innovation in action that involves the generation of knowledge and processes to develop systems that solve problems and extend human capabilities. 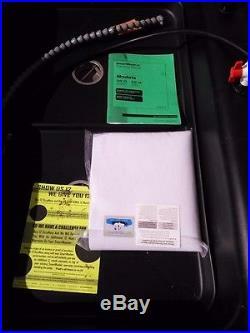 THE SMARTWASHER® is a bioremediating parts washing system. Through the process of bioremediation. 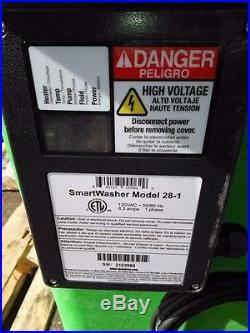 The SmartWasher eliminates the need to haul away used fluid. This system can be broken down into three distinct parts: The SmartWasher. Non-hazardous degreasing solutions and the OzzyMat. Our patented, microbe impregnated particulate traps. THE SMARTWASHER® is constructed from heavy duty HDPE, contains a large 300 gph pump, adjustable thermostat, fluid level sensor and on-board diagnostics. OZZYJUICE® degreasing solutions are pH neural, use no hazardous solvents, are not caustic and have no flash point. These powerful degreasing solutions clean as quickly as premium solvents. THE OZZYMAT is our patented particulate trap impregnated with microbes (Ozzys). Traps large particles of grease and oil along with any particulate matter larger than 50 microns. More importantly, the OzzyMat releases these microbes (Ozzys) into the SmartWasher system. The microbes (Ozzys) break down or eat grease, oil and other organic products in the OzzyJuice and turn those contaminants into harmless carbon dioxide and water - EVAPORATION. This process leaves the OzzyJuice. Clean and strong for every us. MERGING these three products creates one amazing bioremediating parts washing system, The SmartWasher®. And as long as our customers maintain their SmartWasher system properly they should never have to change or haul away their OzzyJuice®. The item "PARTS WASHER NEW CHEMFREE MODEL SUPER SINK 28 FREE SHIPPING FREE SHIPPING" is in sale since Sunday, January 03, 2016. This item is in the category "eBay Motors\Automotive Tools & Supplies\Shop Equipment & Supplies\Other Shop Equipment". The seller is "bigguymiam" and is located in Miami, Florida. This item can be shipped to North, South, or Latin America, to all countries in Europe, to all countries in continental Asia, to Australia.